This week’s guest blogger Courtney Floyd is a doctoral student and Graduate Teaching Fellow in the Department of English at the University of Oregon. Her current research involves Victorian print and media culture, archives and archiving tendencies, and their intersections with gender and disability in late-century novels. She blogs about her research at www.angelinthearchive.wordpress.com. I’ve been using digital technology to communicate my thoughts with the world since I created a GeoCities webpage in elementary school, way back when “advanced technology” and graphic design involving basic geometrical shapes seemed to be synonymous. Blogging is the sandbox of academia. 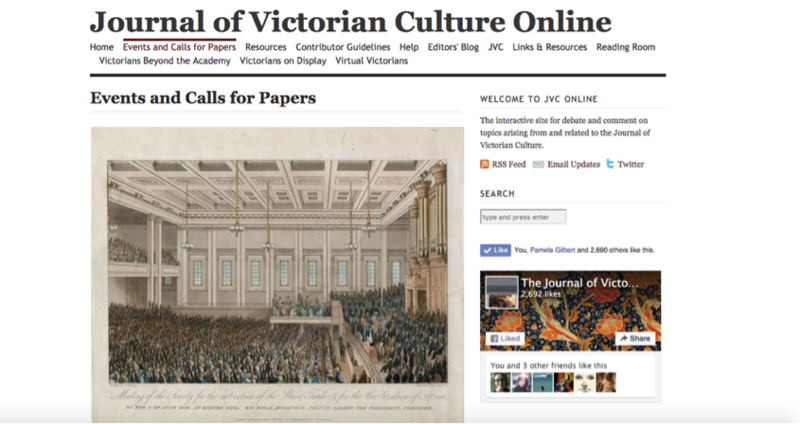 In their online blog/forum, the JVC’s published contributors provide open access, often less formal supplements to their peer-reviewed articles. The blog, in this case, acts as a place where authors can showcase unseen aspects of their scholarship, play with connected ideas that weren’t appropriate or relevant for inclusion in their more formally published work, and engage more immediately with their audience. That brings me to the second reason blogging is the sandbox of academia: participation. Of course, traditional academic discourse involves participation—but it is participation in the long form, drawn out over years due to writing, publishing, and other time constraints. Blogging takes time, too. But because so much social media today is predicated on blogging—or at least intermittent, short form, text-based communication—and so many blogging platforms integrate social networking platforms and interfaces, the medium itself encourages more immediate communication. For example, in addition to commenting on the JVC’s blog posts, I can also share them on my Twitter or Facebook accounts, thereby participating in the discussion by, to steal a phrase from Henry Jenkins, “spreading” the media. I can also more readily identify the other commenters, or participants, and engage with them individually (replying to their comments or following them on social media, for instance) as I engage with the original post. Speaking of blog audiences, blogs often aid increased participation by requiring us to present work to a more generalized audience than we would in a traditional publishing framework. Bloggers can’t assume that their readers are all in their field(s), or even familiar with their larger discipline(s). In this respect, the blog becomes one particularly fecund place for individual advocacy for the relevance of one’s field to the general public. If blogging changes the mode of academic conversation by making it less formal, more accessible, and more participatory, it also encourages us to think differently about the act of communication itself. On the blog, the literal arrangement of words on the page, or the presentation of writing, can be just as important as the content conveyed by those words. To be honest, I chose this layout primarily for its aesthetic appeal. But this spatial arrangement has made me think more critically about the order and topic of my posts. I don’t, for instance, want to flood my blog’s main page with a bunch of posts about neo-Victorian comics, thereby displacing posts about my own research. The visual layout and organization of the blog, that is, manifests as its own sort of syntax, another element to think about when drafting and posting. All that to say, blogging is the sandbox of academia. It can be a place for “play,” but that doesn’t mean it isn’t also serious business. Play is productive; it changes the way we view our world. In this case, the playful, or at least less formal, qualities of the blog allow us to think differently about the ways we communicate, about our modes of participation, and about our discourse communities in general.